Okonomiyaki is fun! It’s one of the foods I fell in love with in Japan. It sounds a little weird if you’ve never seen one, because it’s basically a cabbage-and-dough patty filled with meat and topped with sauce. It’s way more yummy than it sounds, I promise. But it’s easy, it’s basic, and it’s authentic. So I’ve been lazy. Note that this recipe only makes enough for one okonomiyaki, which is a meal for one person. If you have more than one person here, double the recipe and make two of them. Also: She uses very thin strips of pork for this recipe. So if you do the same, make sure they’re thin enough to cook through in a few minutes. (Don’t put big chunks of pork on the bottom–they won’t cook long enough and you will die.) I’ve cooked the meat beforehand and mixed it into the batter before, too. That worked out okay. The person who did this used a pan-safe circular mold. There has to be a better name for this in English, but I really can’t think of it. Augh! Throughout this translation, I just used “circular mold.” Feel free to mentally substitute with whatever word you think works better. That said, the original author did have some good ideas for this. You could use the outer ring of a springform pan if you have one small enough. You can also use pancake molds. Or you can go without and just have an UGLY OKONOMIYAKI. If you’re just making it for yourself, it doesn’t matter, right? Notes on ingredients: To do this “right” you’d really need to have access to a decent Japanese store. I’m generally pretty lazy. I’ve made this without the dashi and the tenkasu before, and it’s been good enough. But if you live near a good Japanese grocery, you shouldn’t have any problem getting dashi. Apparently, you can buy tenkasu, too. I’ve never done this, but paying for tenkasu seems a bit odd. I mean, if it’s just the crunchy bits left over after you fry some tempura, then you could just get out the deep fryer, make some tempura, and strain it out. You could also do what this guy does and just pan fry a little of the okonomiyaki batter. Mix the batter ingredients together until there are no clumps left. If you can, let it rest for half a day. But you don’t have to! Oil the inside of your circular, pan-safe mold. Add the cabbage, tenkasu, and egg to the batter you made in step #1. Heat up your pan. (Note: The recipe doesn’t say how high, but medium-high worked well for me.) Put your mold on it, then pour your batter into it. Put the pork strips on top of the batter. Cover with a lid and cook for 6-8 minutes. Remove the mold. Be careful not to burn yourself! It’ll be hot! Flip it once more and let it cook for one minute without the lid. This’ll crisp it up a little. You’re done! Now you can top it with whatever you want. 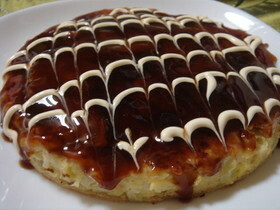 The recipe suggests some very Japanese options: okonomiyaki sauce, mayonnaise, bonito flakes, or aonori. Never push down on the okonomiyaki while it’s cooking. You can use the outer ring from a springform pan. She used a 15cm one. You can use the molds used for pancakes for this. They come in lots of cute shapes.